So, your cats and dogs, around about now are going to cover your entire house in fur. Your vacuum cleaner is groaning at the prospect of another spring and you’re whining about all the extra cleaning you are going to have to do.A sunbeam shines through the window, and in the draft you see fur, floating around your room defying gravity covering every surface in your house. It drives you nuts! Don't worry, we have a quick solution for you. On Wednesday I noticed a blue titmouse gathering some of Snuffy's fur that were in a plastic bag. The bird was furiously grabbing hair here and there as if hoping to avoid attention. Now I know where the fur got off him were disappearing from my yard. Wasn’t sure where they went since we haven’t had much wind lately. I then noticed several birds scooping up the clumps fur and using it to line their spring nests in the trees in my yard. Who knew? What a great way to recycle dog fur. It reminded me of when I was kid visitng our farm and watching titmice steal tufts of fur off of my pet husky when she was napping outside. 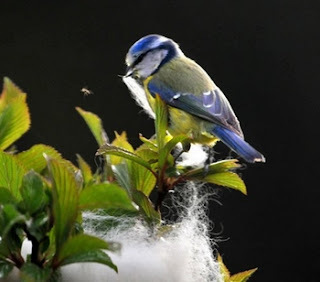 Dog hair (or most pet fur) is great to let loose outside this time of year for bird nesting material. Not only will you be stress-free you would also be able to attract birds and help them build their nest. 1. Go out and buy a fine wire brush. Don’t worry about it seeming to scratchy – they love it. Just be gentle when brushing sensitive parts, such as around the ears. 2. Also run the brush gently over your sofa, switch 90 degrees and run it the other way. 3. Harvest all that fabulous fluffy stuff; keep it in a carrier bag. 4. And now the best bit; the ultimate recycling, put it in a wire cage, or a bag that you might buy onions in, or a hanging pot, and hang it on your bird feeder from about April onwards, depending on where you live.The birds absolutely love this stuff, and since I have been practicing this ‘wild’ form of fur recycling I have seen a whole host of birds I never usually see. They come down and greedily gather the fur and take it off to line their nests. I love the thought of my pets fur lining birds’ nests. Even the cat fur is taken without discrimination; I suspect that as long as it’s not still attached to the cat they don’t care too much! You will find that birds your feeder does not normally attract will start visiting for the fur supplies. So next time your dog needs a good brushing, do it in your backyard and help our feathered friends. Keep your house clean and bird’s nests cozy for eggs and newborn chicks, a win win for all!